Novice Robert Springate gained pole, 3rd and 1st at the RSA round at Brands Hatch, together with the two fastest laps. In his first race a slow start by Springate resulted in an initial drop to fifth but he moved up the field rapidly only to be baulked by superb defensive driving in his duel with second place Florentino, allowing JJ O’Malley to gain a relatively comfortable 1st place result. In the second RSA race, JJ O’Malley had an electrifying start to take an early lead followed by seasoned competitor Graham Johnson. Springate pressured Johnson for the first third of the race. Persistence paid off and with Johnson dispatched Springate hunted down O’Malley with a stunning pass in the closing stages of the race. A red flag finish saw Springate the first man past the post at the crucial moment. 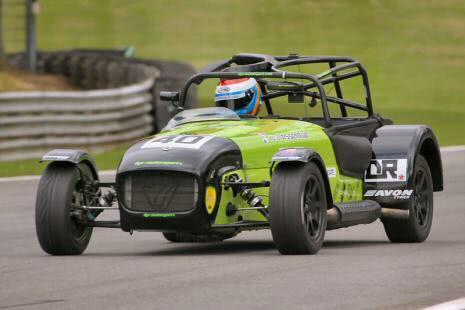 “The one-make nature of Caterham Motorsport results in close racing requiring both man and machine to be 100%. During testing we use on-circuit data acquisition to fully involve the driver in optimising the car set-up for each circuit in a manner that reflects individual driver style and preference. Robert’s form at Brands fully demonstrates the benefits from this unique approach.